Jubee Lee started working with glass in 2013 at Southern Illinois University where she earned a BFA with honors studied in glass and was awarded with prestigious Rickery-Ziebold Trust Award for her thesis works. After completing her undergraduate studies, Jubee is continuing her MFA studies at Virginia Commonwealth University in Richmond. 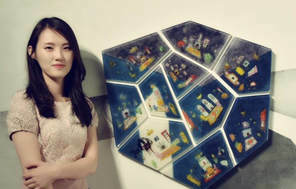 Jubee has training in both 2D and 3D materials and uses her own 2D images as inspiration. She has been working on various types of arts, such as illustrations, printings, paintings, video, installations and objects by using glass as a medium. She makes her own space illusion by using images that create 3D space out of 2D images. Through the interactions between conscious and unconscious worlds, internal and external worlds, and reality and surreality, she creates her own imaginary space: a four-dimensional world. This interaction is an important part of her life when she makes her art. Her recent kiln-formed glass work is a semi-abstracted and atmospheric sculptural painting, which allows viewers to draw associations from their own imagined landscapes.